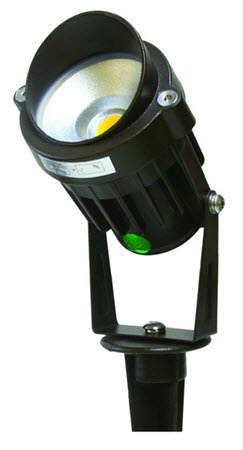 LED 12-volt garden light fixture with a ground mount stake for many types of general ground lighting needs. This is only 6 watts and can be used in low voltage lighting systems. This can work well for garden landscape lighting and you can use it in existing 12 volt transformers. Ideal for general site lighting, landscape, sign lighting, flag poles and pathways. What makes this light so great is that it comes complete with everything you need including the ground mount stake. And for many people,, that they want to keep a low voltage system simple and as energy-efficient as they can get. With this LED garden light fixture you get all of that with a light that's very bright for landscaping. You could use this to up light trees and foliage or merely use it to illuminate a house itself. It doesn't get any easier for the do-it-yourselfer who is trying to upgrade his lighting to make us whole property look better. This also comes in several different light colors so you can get the right kind of light that you want for your situation. Because this only consumes six watts, it's going to be a replacement for something around a 40 watt incandescent. It's a completely sealed unit with tempered glass and a silicone gasket which will prevent any water from getting inside. It's fully adjustable to put it in any direction you want and with a 70,000 hour rated life, it will last you for many years to come. Just in case, it has a five-year warranty against any defect or early failure. So your protected from that with this very high-quality fixture. Can't say enough how easy this is to use and apply to your low-voltage lighting system. If you have any questions as to whether it can work for you or you need more information, just give us a call or email and we can help. Instead of buying some cheap imported light fixture and having to replace it in a couple of years, get something like this that has a diecast housing that's going to last for many years to come. - Tempered glass lens with seam fewer silicone gasket.